Language has the power to both reflect and shape individual and collective identity. In this module, students consider how their responses to written, spoken, audio and visual texts can shape their self-perception. They also consider the impact texts have on shaping a sense of identity for individuals and/or communities. Through their responding and composing students deepen their understanding of how language can be used to affirm, ignore, reveal, challenge or disrupt prevailing assumptions and beliefs about themselves, individuals and cultural groups. Students study one prescribed text in detail, as well as a range of textual material to explore, analyse and assess the ways in which meaning about individual and community identity, as well as cultural perspectives, is shaped in and through texts. They investigate how textual forms and conventions, as well as language structures and features, are used to communicate information, ideas, values and attitudes which inform and influence perceptions of ourselves and other people and various cultural perspectives. Through reading, viewing and listening, students analyse, assess and critique the specific language features and form of texts. In their responding and composing students develop increasingly complex arguments and express their ideas clearly and cohesively using appropriate register, structure and modality. Students also experiment with language and form to compose imaginative texts that explore representations of identity and culture, including their own. 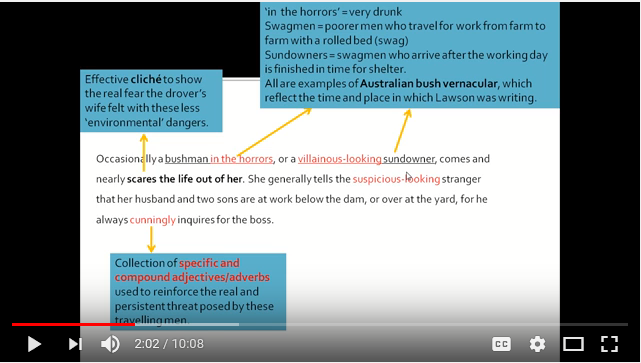 Students draft, appraise and refine their own texts, applying the conventions of syntax, spelling and grammar appropriately and for particular effects (NESA 2019). • How can we define identity? Collective identity? What are some examples from your world. • How can language reflect and shape an individual or group identity? • How can texts impact on the way an individual or a community sees themselves? • What do we understand by cultural perspectives? ​*Note: Resource was specifically created for previous English syllabus Module 'Distinctively Visual'. Much of the analysis of the text, however, remains relevant and useful for current English syllabus Module 'Language, Identity and Culture'. NSW Education Standards (2019). English Standard: Modules. Educationstandards.nsw.edu.au. Retrieved from https://educationstandards.nsw.edu.au/wps/portal/nesa/11-12/stage-6-learning-areas/stage-6-english/english-standard-2017/modules.